Restoring The Landscape With Native Plants: Lets go where the actions is…. The shore! Lets go where the actions is…. The shore! With someone that is in tune with nature, it becomes so obvious. If you want to go to amazing and inspiring places, and find a hotbed of biological activity, you simply search out areas where land meets water – the shore! Unfortunately, in urban lake systems, shorelines get assaulted in a wide variety of ways. Impervious surfaces in urban watersheds cause lake levels to “bounce” – having high highs and low lows. Flood waters cause erosion along the shore. Increases nutrient levels in storm water runoff favor invasive species, like reed canary grass. On top of this, humans have traditionally liked tidy shores – turf up to the water, imported rock to curb erosion, sea walls to create a clean, engineered edge. The list goes on and on. species that colonized over the years. Beginning in 2004, the City of Plymouth, a suburb of Minneapolis, was on the forefront in created a cost-share program focused lakeshore ecological restoration. Funding was secured through a Minnesota DNR Clean Water Grant. 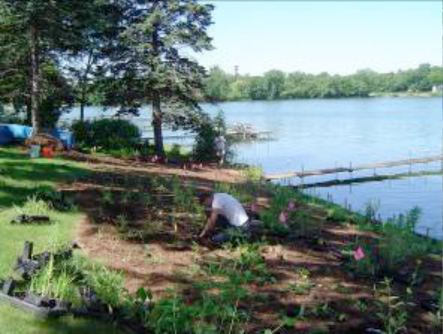 Our company, Natural Shore, had the privilege of working with City staff and numerous shoreland owners to design and install over 20 restoration projects on Medicine Lake. shoreline species could get established. Natural Shore staff first met with the Lennons to discuss overall project objectives, how they use their shore, what sort of look they expected, and of course, their budget. After going back and forth with key design elements, the Lennons chose a plan that included a fairly extensive natural buffer along their property. Probably one of the most challenging aspects of our work is to meld shore stabilization with ecological function and aesthetic appeal. 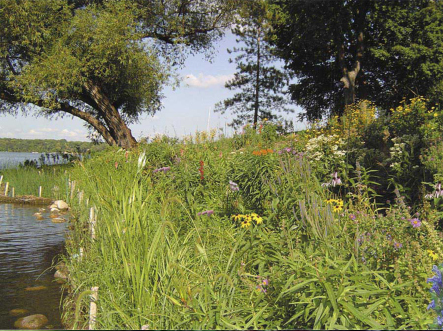 This boils down to selecting appropriate native plant species, after assessing a variety of shoreline parameters, and use planting methods that will assure survival and expansion. This is where our work can become very complicated. On the Lennon Property, we had to factor in that urban “bounce”, wave action from wind and high speed power boats, soils, slope, shade, and even muskrat activity. After compiling our species list, we then figured out what bio-engineering materials we would use, materials like erosion control blankets and bio-logs (coconut rolls). The Lennons have expressed that the project really exceeded their expectations. 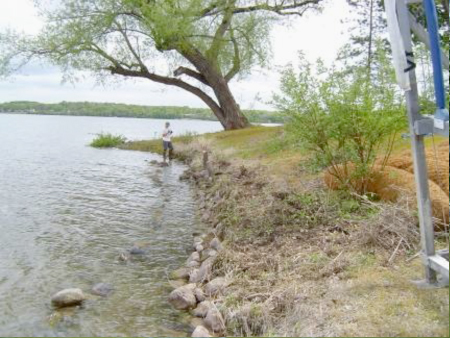 They now have a stable shore that provides excellent habitat for a wide variety of fish and wildlife. Being one of the first on Medicine Lake, the Lennons provided a high quality demonstration of what a natural shore is all about. 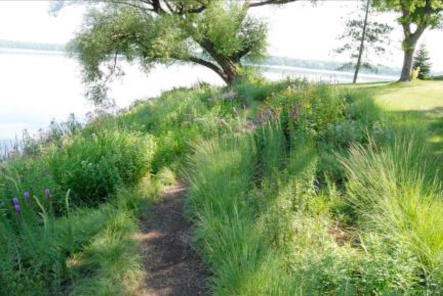 Many shoreline and prairie species flowered the second year after installation. 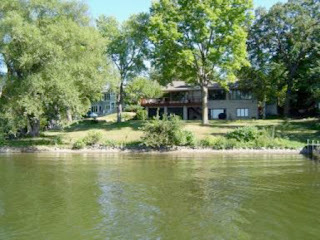 The Lennon’s project came out at $13,000 for 120’ of shore. Our restoration projects usually range between $40 and $110 per linear foot of shore. High energy shores with a lot of wave action cost more due to re-grading and the use of erosion control materials. As with any ecological restoration in an urban setting, long-term maintenance is essential. With shore restorations, weed seed can infiltrate via wind and waves. 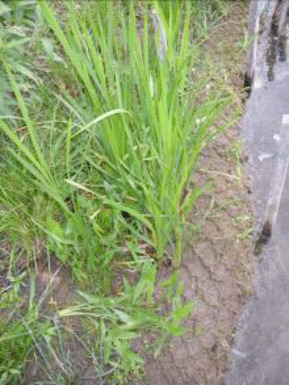 For instance, reed canary grass seed floats, and a windy day in late June may result in this weed seed surfing from one side of the lake to the other. Our maintenance and monitoring of the Lennon property is $650 per year, which includes spring clean-up, and 3 visits during the growing season. As we all know, urban ecological restoration presents a host of challenges, but we are seeing progress along our shores. More and more cost-share opportunities are becoming available through various units of government. And slowly, shore residents are becoming familiar with ecological restoration as a way to manage their properties. Bill Bartodziej and Rob Langer are Ecological Restoration Specialists, and own Natural Shore. For more information on their company, please visit: www.naturalshore.com.